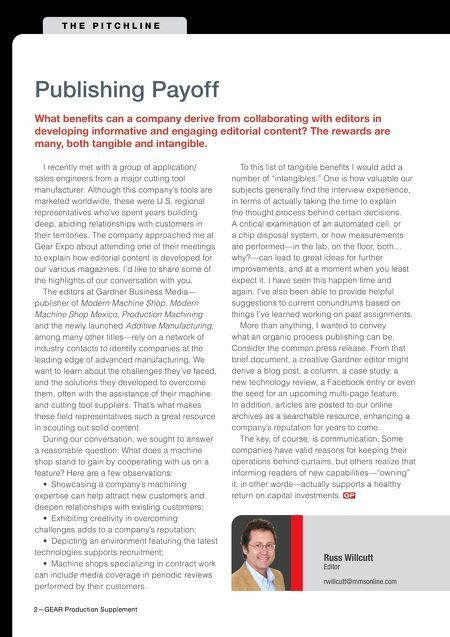 2—GEAR Production Supplement T H E P I T C H L I N E Russ Willcutt Editor rwillcutt@mmsonline.com Publishing Payoff What benefts can a company derive from collaborating with editors in developing informative and engaging editorial content? The rewards are many, both tangible and intangible. I recently met with a group of application/ sales engineers from a major cutting tool manufacturer. Although this company's tools are marketed worldwide, these were U.S. regional representatives who've spent years building deep, abiding relationships with customers in their territories. The company approached me at Gear Expo about attending one of their meetings to explain how editorial content is developed for our various magazines. I'd like to share some of the highlights of our conversation with you. 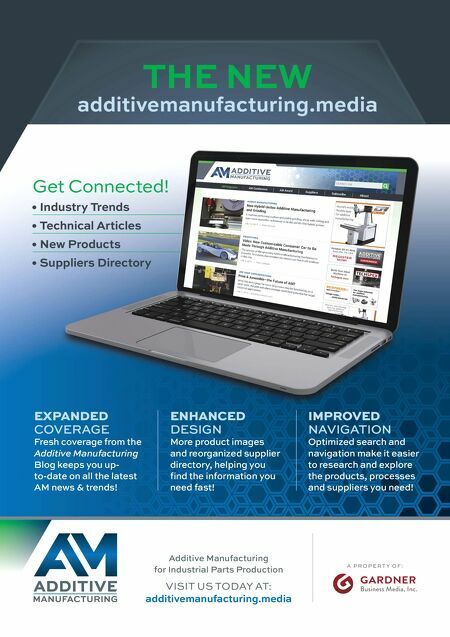 The editors at Gardner Business Media— publisher of Modern Machine Shop, Modern Machine Shop Mexico, Production Machining and the newly launched Additive Manufacturing, among many other titles—rely on a network of industry contacts to identify companies at the leading edge of advanced manufacturing. We want to learn about the challenges they've faced, and the solutions they developed to overcome them, often with the assistance of their machine and cutting tool suppliers. That's what makes these feld representatives such a great resource in scouting out solid content. During our conversation, we sought to answer a reasonable question: What does a machine shop stand to gain by cooperating with us on a feature? Here are a few observations: • Showcasing a company's machining expertise can help attract new customers and deepen relationships with existing customers; • Exhibiting creativity in overcoming challenges adds to a company's reputation; • Depicting an environment featuring the latest technologies supports recruitment; • Machine shops specializing in contract work can include media coverage in periodic reviews performed by their customers. To this list of tangible benefts I would add a number of "intangibles." One is how valuable our subjects generally fnd the interview experience, in terms of actually taking the time to explain the thought process behind certain decisions. A critical examination of an automated cell, or a chip disposal system, or how measurements are performed—in the lab, on the foor, both… why?—can lead to great ideas for further improvements, and at a moment when you least expect it. I have seen this happen time and again. I've also been able to provide helpful suggestions to current conundrums based on things I've learned working on past assignments. More than anything, I wanted to convey what an organic process publishing can be. Consider the common press release. From that brief document, a creative Gardner editor might derive a blog post, a column, a case study, a new technology review, a Facebook entry or even the seed for an upcoming multi-page feature. In addition, articles are posted to our online archives as a searchable resource, enhancing a company's reputation for years to come. The key, of course, is communication. Some companies have valid reasons for keeping their operations behind curtains, but others realize that informing readers of new capabilities—"owning" it, in other words—actually supports a healthy return on capital investments.